Ryan Wertz scores on a layup during Butler’s 47-41 win at Sidney on Tuesday night. Quentin Glover looks to score inside during Butler’s 47-41 win at Sidney. Tyler Montegue scores on a layup during Butler’s win at Sidney on Tuesday. 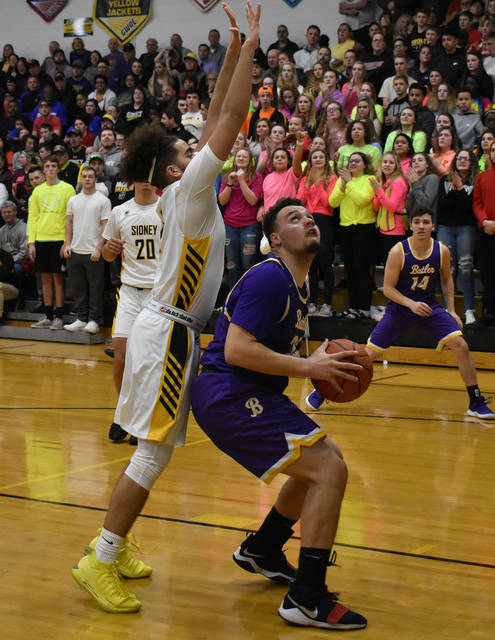 Bryant Johnson takes a shot during Butler’s win at Sidney on Tuesday. 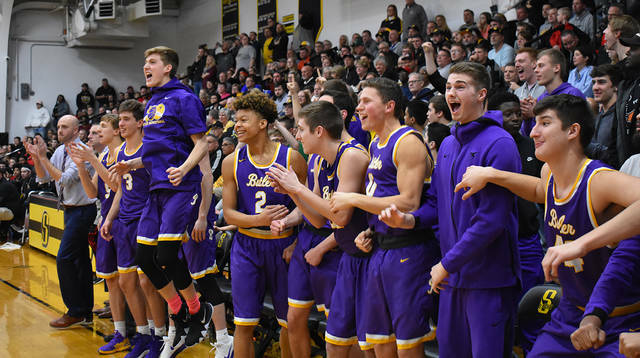 Butler’s bench celebrates in the closing seconds of the Aviator’s win at Sidney on Tuesday. 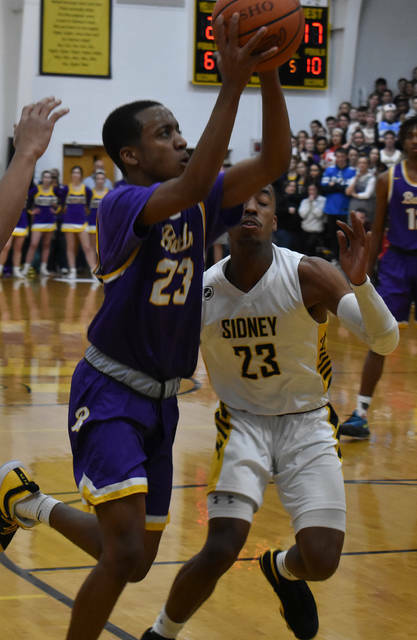 SIDNEY — A hot start and a hot finish proved to be a winning formula on Tuesday night as the Butler Aviators went on the road and defeated Sidney in the de facto Greater Western Ohio Conference North division championship game. 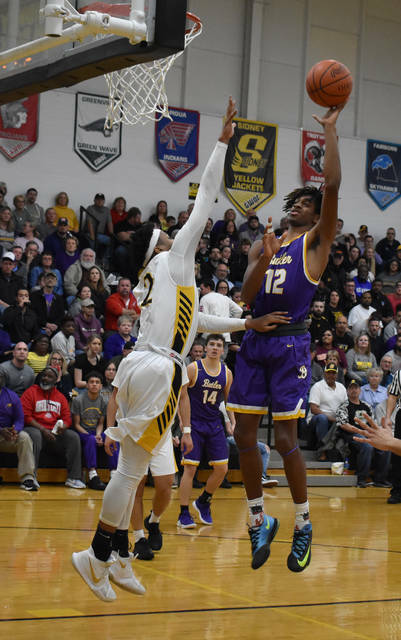 Butler (19-2 overall, 12-2 GWOC North) jumped out to a 15-0 lead and closed the game on a 10-2 run to pull away for a 47-41 win in front of a sell out crowd. With a win over Tippecanoe on Friday, the Aviators will claim their first outright league title since 2003. Butler couldn’t have asked for a better start. Cold shooting by the Yellow Jackets and good execution by the Aviators saw Butler jumped out to a 15-0 lead to open the game. Sidney’s first points came at the 1:00 mark of the first quarter on a pair of made free throws. Those points sparked an 18-0 run by the home team however as Butler went nearly five minutes without scoring. Quentin Glover finally ended the drought, but Sidney still held a 22-21 lead at the half. 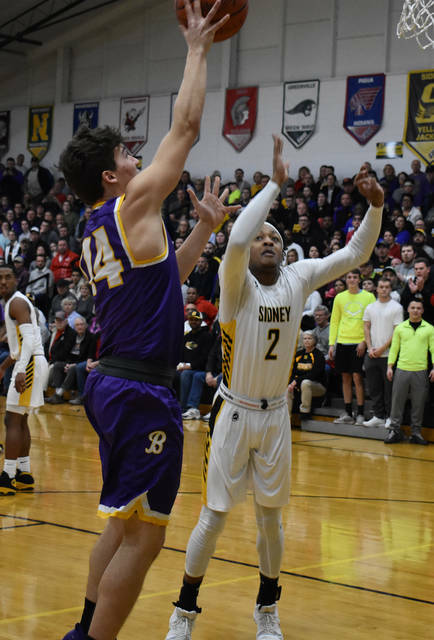 Back to back baskets by Sidney’s star Andre Gordon gave the Jackets their largest lead of the game at 29-24 midway through the third period, but Butler sharp-shooter Braedon Norman was just heating up. Norman hit two three-pointers and a layup as the Aviators closed the quarter on an 8-3 spurt to retake the lead at 34-32. Norman led all scorers in the game with 18 points. Sidney made a final push with five quick points to open the fourth quarter, but the Aviators made big plays down the stretch. Bryant Johnson hit a pair of free throws with 3 minutes left to tie the score at 39-39, and Ryan Wertz hit a three pointer from the left elbow with 1:48 to play that gave Butler the lead for good at 42-39. Johnson nailed a pair of free throws with 21.5 seconds left to seal the win. Butler won the game despite playing its second straight without Michael Kreill, the team’s leading scorer and point guard. Wertz said the Aviators knew they needed to step up and fill the void left by Kreill’s absence. Butler will host Tippecanoe on Friday for senior night. Tip time is set for 7:30 p.m.